Wow, it’s Wednesday already and time for me to share my favorite finds on the web. There is a theme this week and it’s British..seems our friends across the pond have the most pawsome feline news this week, so Tally Ho and enjoy this week’s listings. I’ve said it before, and I’ll say it again, those Brits know a thing or two about showcasing moggies (and in this case doggies as well). The Guinness World Record folks will launch a pop up in London on October 27-28 at 2 Soho Square, W1D 3PX. If you happen to be in the area, you can book a spot by sending an email to: amazinganimals@hopeandglorypr.com. (I’m hoping our friends at Katzenworld will meander on over there and report on the event. This “fluffytorium” as it’s being billed, will afford people the opportunity to pet some of the world’s longest haired cats and dogs in a fluffy, fur decorated room. The event is to introduce their new book, Amazing Animals, and attendees will have an opportunity to obtain a copy of the book at no charge. A word to my cat loving audience, Friday is feline day. If you book for Saturday, you will be petting furry canines. Sometimes, the things humans do just make me shake my head. Purruse these cat and dog hair cuts and you’ll be wondering too. Note to my humans…..don’t even think about it! And speaking of our friends at Katzenworld, I found this report of a UK Top Cat competition. Genie, a black and white 8-year old cat was the overall winner in the 2017 Cats Protection’s National Cat Awards. Genie won her title thorough her love and help for her 12-year old human Evie as she fights bone cancer. Genie has been the catalyst for Evie to get out of the hospital and get home. The celebrity judging panel had quite list of distinguished felines to choose from in this yearly competition. 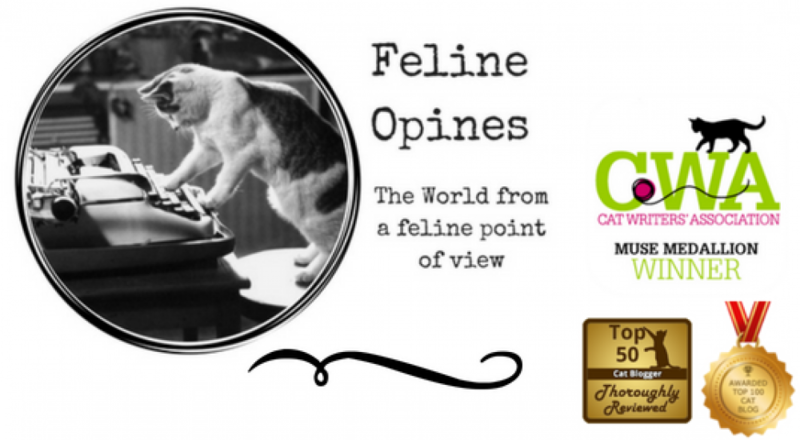 Head on over to Katzenworld and read about Genie and Evie and the other incredible felines that were in the running for this top feline honor in the UK. Yes Virginia, there IS such a thing as a therapy cat. Just go to the Denver International Airport to find out. The airport has maintained a Canine Airport Therapy Squad, referred to as CATS, and now they have a real cat on their crew. Xeli, the handsome Tabby is the first cat to join the all-dogs league as a therapy kitten to greet travellers. The CATS program at the airport is designed to help relieve travelling stress and anxiety. The female human is not a happy flyer and she’s hoping her next flight takes her through Denver so she can get some stress reduction therapy from Xeli. The female loves what she calls “feel good” stories and this one is the best. For anyone who doesn’t believe that we felines can’t contribute significantly to the lives of humans, you must read this. Seargeant Josh Marino suffered a traumatic brain injury from a mortar during his tour in Iraq. His life was changed after this experience and he returned home with post-traumatic stress disorder. He lost all interest in living and planned to take his own life, until a little kitten meowed her way into his heart and helped him heal. You’ll have to click here to read the rest of the story. I agree, we admire fluffy cats too, sadly none of the Tribe of Five is very fluffy…unless something scares us and we manage to get a big fuzzy tail! this is awesome articles all about kitties! great finds 🙂 I will tune in on Wednesdays to read more from the Cat news – I also shared them with Patches (in my photo) and he was shocked by the sheared cat, but quite impressed by the crowned cat! Thank you so much for your kind words. I try to find the best of feline news every Wednesday. This week I even found two humans who climb trees to rescue cats! Tell Patches (who’s quite a handsome fellow I might add) that I’m with him, shearing cats is a no-go at our house.